Mitsubishi Motors South Africa is launching the Mitsubishi Pajero Sport Shogun Limited Edition, based on the popular Pajero Sport 4×4 8-speed A/T, offering customers a vehicle ready for their family action adventure – staying connected and fully equipped with all the necessities to explore their active lifestyles. Whatever your destination, the Pajero Sport Shogun will get you there, combining reliability, comfort and safety for the ultimate terrain-conquering performance. It’s built for the family adventures all the best memories are made of. The new Pajero Sport Shogun is based on the Mitsubishi Pajero Sport 4×4 A/T which has been selected as a finalist for the 2019 South African Car of the Year competition, to be announced in April 2019. Apart from the Apple CarPlay/Android Auto Infotainment System, the Pajero Sport Shogun is fitted with attractive and practical Thule roof racks, a headlamp protector set, a bonnet guard, a black nudge bar, black mag wheels, black door handles, a boot cover, side window visor/deflector set, tow bar, Shogun decals in black and silver and a Shogun carpet set branded in grey. 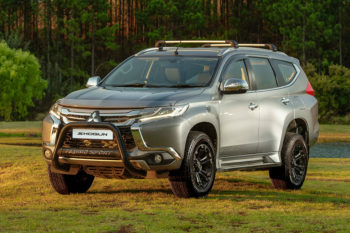 “With the upcoming holidays – for many people their annual break – the Pajero Sport Shogun offers the right equipment at the right price for any adventure,” concludes Campbell.